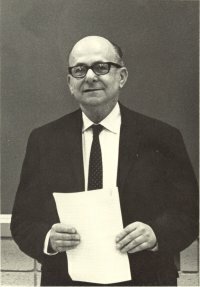 The Herzog competition is a long-standing tradition in MSU, in honor of Prof. Herzog, who devoted significant efforts to undergraduate education, in particular to prepare students for the Putnam exam, and he was quite successful in it. Any undergraduate at MSU can participate. High school math will be assumed, some questions somewhat beyond that level of knowledge (e.g. where a basic calculus knowledge is needed, or some basic notions regarding differential equations) might be asked (but not many, so that freshmen are only at a minor disadvantage with respect to seniors.) Otherwise you just need common sense and substantial ingenuity! The problems will be in general easier than the Putnam competition problems, but the results of this competition will be used to rank the students that want to participate in the Putnam exam into the team that will represent MSU at the Putnam math competition (see last year's Putnam webpage.) Anyone can participate in the Herzog competition: there is no commitment to take the Putnam exam. For a list of other winners, please click here. Recent exams are listed below. For more exams click here.